Connor Black knows what it feels like to win a national title – sort of. Black is even more familiar with the feeling of having that title ripped out of his hands within seconds. The Forest, Ont. native and Guelph Gryphon was first to cross the line in the controversial 2017 U Sports 3,000m final (click for video). The problem: due to an official’s lap counting error, the athletes had only been running for 2,800m, one lap of the 200m track short, when they were told to stop. Having already raised his arms in victory, Black hopped back into the race and managed to salvage a fourth-place finish, conceding what he thought was gold. 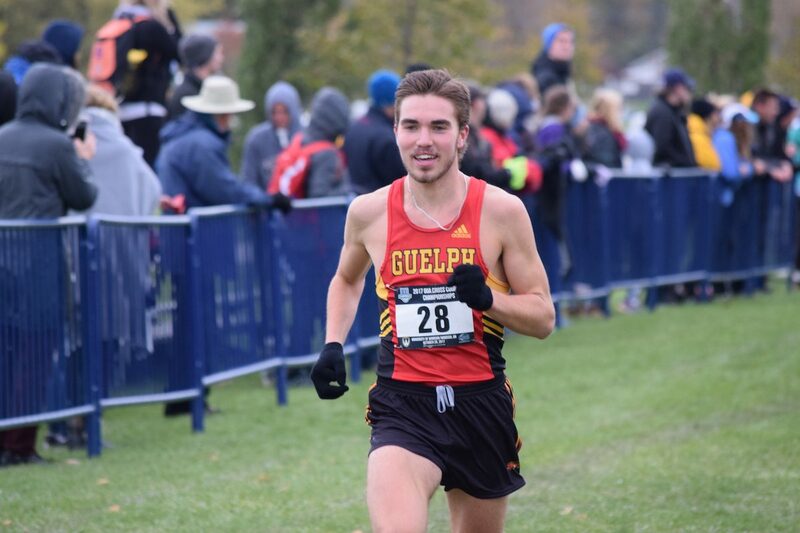 Now hungry for a medal, and fresh off an OUA cross-country title, the fourth-year kinesiology student is looking for redemption. Alex Cyr: How has your training been going over the last few weeks? CB: The best it has ever been. Two workouts before OUAs gave me a good sense that I was ready. Since then, it’s been fantastic. We were doing a mix of miles and 400m repeats, and I was able to drop a 4:20 mile (editor’s note: that’s fast). It was a good confidence booster. AC: You dealt with an injury during the 2016 cross-country season, and exited the running scene for a few months. But, since 2017 hit, you have caught fire and have been consistently strong. Is there anything you changed in your training that permitted you to stay healthy? CB: I’ve been doing less, which sounds a little counter productive. I was in the mindset that I needed to work, work, work. Since getting healthy, I’ve taken an aggressive approach and did a bit less mileage, while spending the extra time focusing on recovery. The little things are big for me. I make sure to get enough sleep, and I cleaned up my diet this year. All the details add up. AC: You’ve seen yourself really take flight this calendar year. You’ve made the difficult jump from strong competitor to perennial contender. Aside from the obvious physiological improvements that come with consistent training, what is different in your mental approach now that you’re expecting to win the big races, rather than just to compete in them? CB: In the spring at U Sports, there was a lot of surprise when I competed for the win. Since I’ve gotten to Guelph, I’ve had this belief that I belonged up there, and I’ve been waiting to show it. That track season of 2017 was my coming out party. Now, since Aug. 1, I told myself that I wanted to gun for a title. I don’t want to stop at anything less. Being the captain of the young squad, I take pride in leading them not only vocally, but also by example. AC: I can see from the Instagram account (@thepeloton7), you live in a house of runners. How does this impact your day-to-day life? Do you think it has an effect on your performance? CB:Absolutely. The house consists of Brayden Seneca, Ben Workman, Mark Patton, Thomas Kemp, our friend Chris Kimmer and myself. We are very dedicated to running. I think the culture that you are immersed in has a huge effect on how you shape yourself. We’re eating well, sleeping well… I think it’s huge. It’s nice to have Brayden around, as he was our captain last year. AC: It’s pretty obvious that you guys are gunning for the title this year. What is it like to run on a team with such a winning legacy? CB:It’s been different in these last few years. We used to have a phenomenal team, with a few guys who had run under 29:00 for 10K. Then, we were expected to win. This year, however, we have zero All-Canadians but a bunch of grinders. If you asked us back in August about our chances at winning the title, it was in the back of our minds, but not a stand out goal. The goal is to work hard with what we have and optimize our chances. Who are you looking forward to see at the U Sport championship? My boys. Seeing them and their excitement this week is contagious… wait until the 12th rolls around, it will be something else. I love these guys. Alex Cyr is a St. FX alumnus and a runner for the Windsor Lancers who writes when he can’t run, and runs when he can’t write.